The machines that we most commonly refer to as ATV’s today came to fruition as the first three wheeled ATV’s were manufactured by Honda in 1970. As time went on, the 1980’s saw the advent of suspension systems and lower profile tires for all terrain vehicles. It didn’t take long before outdoor enthusiasts, such as hunters, took note of the rugged versatility of these first three wheeled ATV’s. As the popularity of three wheeled ATV’s spiked, a number of companies followed Honda in manufacturing their own version of the vehicles. However, in 1982, Suzuki took a new path in the development of a recreational four wheeled ATV. And thus, the “quad” was born! High performance joined the mix in 1985 as Suzuki introduced the LT250 Quad Racer that would, by the end of its run in 1992, feature long travel suspension and a 6-speed manual transmission. Honda and Kawasaki weren’t far behind as they continued to introduce new models of quads to the recreational market. In the mid-‘80’s, sand lovers got a boost with Yamaha’s introduction of the ever popular Banshee. Due to its unique power house and overall construction, the Banshee remained a top choice of sand dune riders until it was discontinued in 2006 due to Environmental Protection Agency two stroke emissions regulations. The next big thing in ATV’s, four wheel drive, came to the market in 1986 as the Honda Four Trax system brought 4×4 capabilities to the ATV market. 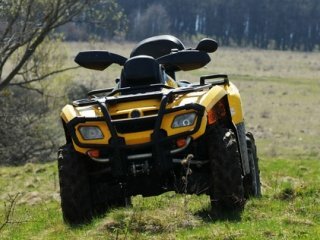 To this day, four wheel drive ATV’s remain the most popular option for ATV enthusiasts due to their ability to maneuver through a wide array of terrains. Quads had their chance to saturate the market in 1987 when production of 3-wheeled ATV vehicles ceased. Unfortunately, 3-wheeled models posed a number of safety risks due to stability and handling issues. After a number of rollover accidents resulting in serious injuries and deaths, the Consumer Products Safety Commission rallied around efforts to ban the manufacture of three wheelers. Fortunately for the ATV community, however, 4-wheeled vehicles continue to grow in popularity to this very day. As time goes by, manufacturers continue to introduce new technologies that provide additional power, better handling and more fun for riders. The growing popularity of utility terrain vehicles, also referred to as side-by-sides, will presumably continue to push the ATV market into new, exciting directions. And that’s good news for the next 30 years of ATV enthusiasts!